in the middle of town, you can buy this condo for a great price, tranquil atmosphere and great rental potential. at the same time have quality time and enjoy tranquil and private moments in the Caribbean, which sometimes creates a difficult question to answer between the financial and privacy aspects. No one wants to buy property, come down to Mexico and be in the middle of a huge party. We all live here to enjoy the Caribbean Lifestyle, the beach and the tropical sun, the great food and the friendly people. And one can enjoy best this mixture while living in a place perfectly suited to recharge the batteries after months of hard work and cold winters. The 2 Penthouses for Sale in this amazing Complex make this question less and less important. personally I am a big fan of living in the center of town, as long as the environment is very peaceful and I feel a million years away from the buzz when I close the door. Just check out the pictures of the common areas and the private rooftops when you click on the photo above. 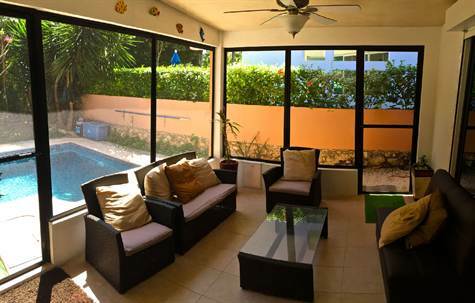 You will find more helpful information why this is one of the best real estate deals in Playa del Carmen there. Just imagine you can live between 5th Avenue and the Beach in Little Italy, which is probably one the most expensive parts for property in town, buy cheap, relax with the birds in the morning, have a coffee looking at all those tropical plants and when you are ready go to Mamitas or Kool Beach Club or drive down to Tulum if you feel like it. More Condos and Homes for Sale in the Riviera Maya you can find on our website as well as on Facebook and Youtube. 4 Bedroom Home for Sale on the Golf Course – walking distance to the Caribbean Beach. This is one of the very rare opportunities, where you can buy a great villa for a very discounted price. Real Estate in Playa del Carmen and surrounding area is in high demand, so there is a good chance prices go up. It is the best moment to buy on of these properties listed at discounted price and enjoy the value of your property going up over the next year. There is still lots of condos and homes for sale and will probably always be as they are mostly second homes, but if you buy real estate in this area of mexico right now and pay a fair price, chances are very good your investment will gain in value in the future. 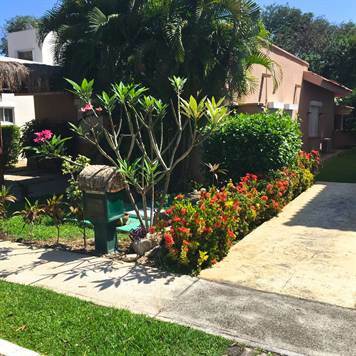 This 4 bedroom House is located at the Golf Course in Puerto Aventuras, you can enjoy the big garden, the lot has almost 8000 sqft, the beautiful landscaping, the quiet atmosphere, the quick walk to the beach and the Marina with all its restaurants and of course the property itself with its 4 bedrooms and spacious interior and terrace spaces. For more info, just click on the picture or visit us on our Homes for Sale Playa del Carmen Website and find us on Point 2, Facebook and Youtube. On your last trip to Playa del Carmen, have you checked the real estate opportunities waiting for you in this Part of the Mexican Caribbean? One area to find great condos for sale is Coco Beach, where you find the newest and most modern real estate. There is no area with more construction going on and all the news restaurants and shops open in this part of 5th Avenue. If you like to find more info about this property for sale in Coco Beach, just click on the picture. For more info about more Real Estate here check out our website Homes for Sale Playa del Carmen and visit us on Point 2, Facebook or Youtube.